Fire-rated assemblies may also be selected from one of the prescriptive assemblies provided in IBC Section 721 based on ASTM E 119 or UL 263 test results, or by calculating an assembly’s capacity using IBC Section 722. The AWC publication Design for Code Acceptance (DCA) 3 – Fire-Rated Wood Floor and Wall Assemblies is also helpful in determining the fire rating of wood-frame wall and floor/ceiling/roof assemblies, and is available free at www.awc.org. 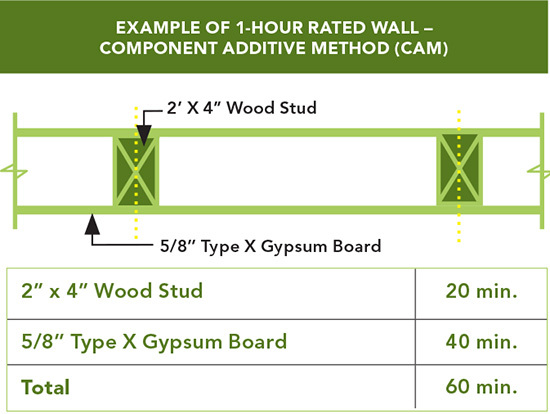 To permit use of “non-listed” assemblies, IBC Section 722.6 also recognizes a methodology for calculating the fire endurance of load-bearing and non-load-bearing wood assemblies (floor, wall, ceiling and roof assemblies) through a calculation methodology called Component Additive Method (CAM). CAM was developed in the early 1960s by the Fire Test Board of the National Research Council of Canada and validated through full-scale wood-framed assembly fire tests. ▶ additional protection due to the use of cavity insulation or reinforcement of the membrane. Section 722.6 contains the procedures by which fire-resistance ratings of wood assemblies can be established using this calculation method. AWC’s publication DCA 4 – Component Additive Method (CAM) for Calculating and Demonstrating Assembly Fire Endurance provides a history of the method and an in-depth explanation of its use and application. Architect: Gensler. Structural Engineer: Martin/Martin. Photo: Matthew Millman. 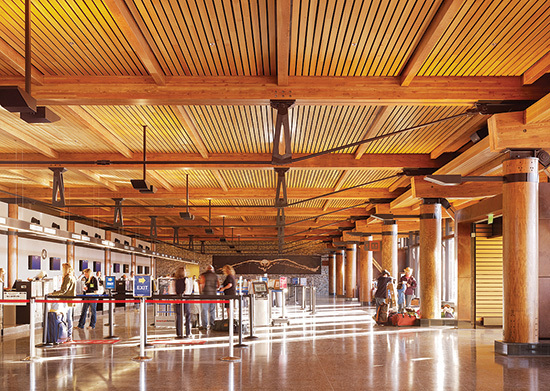 For the Jackson Hole Airport in Wyoming, designers chose wood because of its varied grain and color palette, as well as its ability to perform structurally under a variety of loading conditions. The inherent fire performance of heavy timber construction was vital in allowing the wood to be exposed. Winner of a 2015 WoodWorks Wood Design Award. Architect: EHDD. Structural engineer: Tipping Mar Structural. Photo: Jeremy Bittermann. 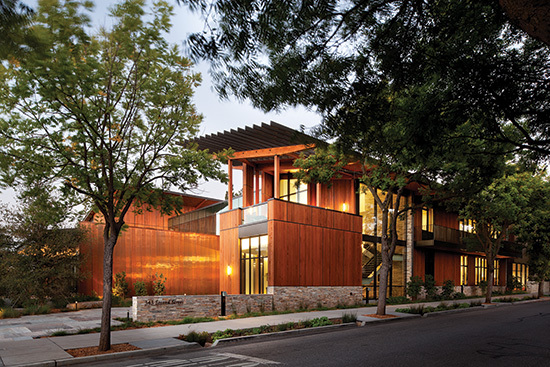 At the David & Lucile Packard Foundation company headquarters, wood was an important part of the strategy to achieve LEED Platinum certification.